The Agricultural Dome is your food source. New research discoveries can enhance food production, but your main concern will be to keep your domes functioning to provide enough food for the current size of your population. 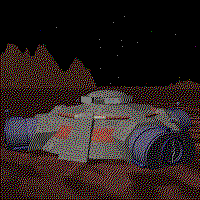 The presence of a dome also increases morale, since the colonists can see that they aren`t going to starve. The Closed Habitat Atmospheric Production (CHAP) Facility produces the basic life support gases your colonists need to survive, as well as by-products such as water. 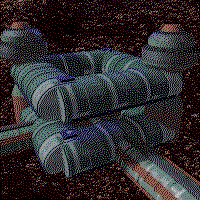 Air is provided to other structures from the CHAP through the Tube system. 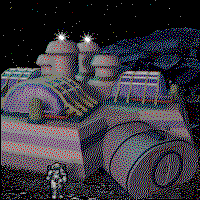 The Command Center is a self-contained structure which serves as the core of any colony. 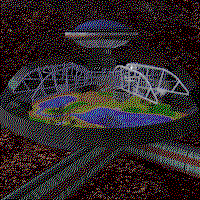 While the first one is built by the Seed Factory to provide a safe workshed and temporary living structure while the first colony is being built, new ones can be placed by you to create independent new colonies. Since Command areas can`t overlap, you will be warned if you attempt to place a Command structure too close to an existing Command tile (as a general rule, a new one can`t be within a 30 tile radius of an existing Command structure). 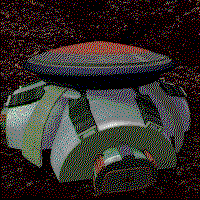 Although the Command tile has its own battery power supply, it`s a good idea to start mining operations in the area first, then bulldoze the location for your Command tile. After the new Command structure is built, a CHAP Facility will soon be needed to provide life support for the Command structure and your other new buildings that will follow. 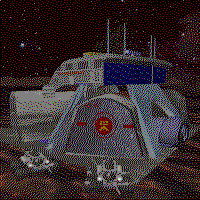 The Command tile also houses the Engineering team, which can repair structures that are broken or due to break. 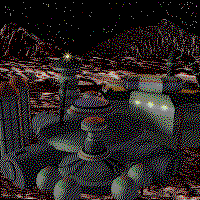 The Communications Tower keeps a colony in contact with its wide-ranging robots and with other colonies. Each tower has a limited range, so if your robots are wandering off never to be heard from again, try building some more towers further away from your colony. The Disaster Instant Response Team Facility (DIRT) helps to minimize damage from unpredicted events that occur to your structures, such as meteorite strikes, explosions, and so on. The DIRT response area is limited, since the environment is hostile and bad things happen fast. 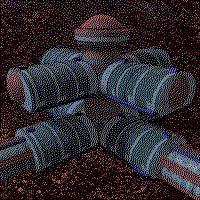 On the average, the DIRT Facility can protect structures in a 5 tile radius around itself. The closer a structure is to a DIRT team, the more likely it is to survive bad events with minimal damage. Surface factories can produce robots, robot spare parts, road material, and other potentially toxic materials which are not allowed into the underground environment. As with other surface structures, the factory is heavily shielded, but must be evacuated to keep the workers safe during solar flares. The Hot Lab is designed to house potentially dangerous experiments. As such, it is prone to the occasional explosion which may penetrate the containment vessels, which is why the structure is composed of several different experimental areas located on the surface of the colony. 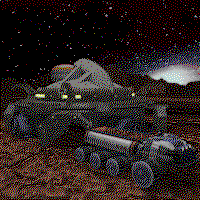 The Mass Driver is an electromagnetic rail gun designed to launch payloads into orbit where they`re caught by a big net. Resources are the most common payload, making it easier to build large spacecraft in orbit without having to run freighters back and forth with smaller loads. 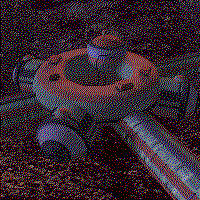 Once a robominer has dug at least one level of a mine, the top of the mine shaft appears on the surface to mark the mine`s location. 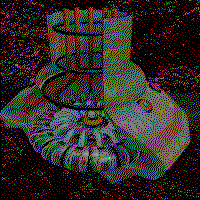 It`s important to be aware of mine and colony locations, both on the surface and underground, since it is possible for a robominer to dig its way down into an active subterranean level of your colony, which has unfortunate side effects. 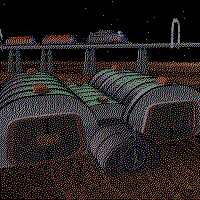 Mined ore is stored at the surface until a monorail or trucks arrive to pick up the load for transport to the Smelter. As soon as nanotechnology has been discovered through extensive research, and the capability of creating this facility is generated, it`s a good idea to build at least one of these in each of the colonies you own. As soon as this facility is completed, resources will no longer be a limiting factor to the growth of your colony. When a Police station is placed on the map, you can choose the attitude which you`d like your human or robot police to use on the local population. “Benevolent” police reduce the Crime level by half in a radius of 5 tiles surrounding the Police station, while improving Morale by one point per turn. “Hostile” police reduce the Crime level to zero in a radius of 5 tiles, but Morale is also reduced by one point per turn. Robot Command is your centralized robot control facility which issues orders and maintains contact with your explorers, miners, repairbots, and other wandering robots. If a robot`s fuel cell fails in the field, Robot Command will receive an alert so that a repairbot can be dispatched to make repairs. All robot control functions are handled from this location, working closely with the Communication Tower signal relays. 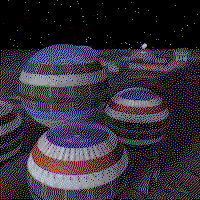 Each robot command facility can operate ten robots. If you want to operate 11 robots, you will need to build a second robot command facility. If a robot factory has produced robots, and a warehouse exists to store the robots, and at least one robot command facility exists to operate ten of the robots, they will appear in your Tile Picker window so that you can place them on the tile map. If all of the currently available robots are active, no robots of that type will appear in the Tile Picker window. The radius of a robot command area is unlimited if you have a communications satellite in orbit (assuming you packed one when you left Earth). 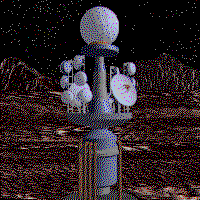 If you have no communications satellite, communications towers must be built to extend the range of your robominers and other robots. 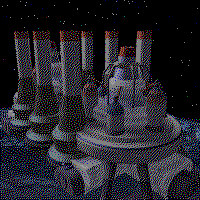 Each robot command facility and each communication tower have a communications radius of 30 tiles. 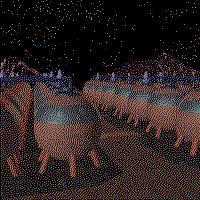 The Seed Factory is a sophisticated form of automated factory which lands on the planet before the humans arrive, preparing the landing site for colonization. It has a limited number of special capabilities, such as robot production and ore processing, which make it a multi-purpose facility. 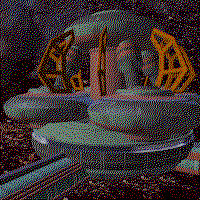 The original Command structure is also generated by the Seed Factory. The Smelter / Ore Processing Facility is where trucks or monorails transport mined ore for processing into useful resources. It has a limited storage capability, so processed resources must be moved to colony storage tanks on a regular basis. 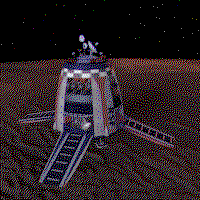 The Solar Powersat Receiver Array, also known as a rectenna, is necessary to produce power from the focused microwave energy beamed down to the surface from a Powersat. If no Powersats are in orbit, these are not necessary. Up to two Receiver Arrays can be used per Powersat to make full use of the microwave beam. The Sewage Processing and Environmental Waste Facility (SPEW) is the recycling center for your colony. Sewage and recyclables are shipped to the SPEW on a regular basis for processing into a very useful resource known as Multi-Purpose Goo (MPG). Bulldozed structures are also shipped to the SPEW so that their valuable materials can be reclaimed. 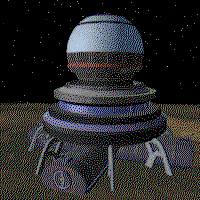 It`s a good idea to build one of these early in your colony`s development to make up for the lack of any local resources that might be limiting your building program. The colonists are aware of the importance of recycling, so their Morale also improves when you build a SPEW. Storage Tanks are an important early addition to your colony, since they serve as the delivery point for all of your resources from the mines that have been processed for use. Until the resources are in your Storage Tanks, they are not available to the colony for building and maintenance of your structures. Either trucks or monorails can deliver the resources to your Storage Tanks, which can hold 1,000 units of any resource. 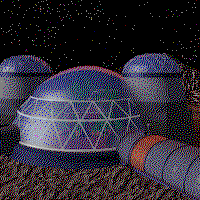 The Terraforming Facility, not to be confused with the CHAP Facility, is used to create a breathable atmosphere for your entire planet. 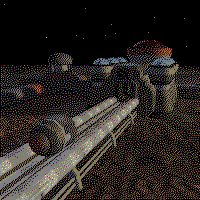 Considerable research must be performed before this structure becomes available for you to build late in the game. This tile provides a major Morale bonus for your population. On a planet that's far from its primary star, the Tokamak Fusion Reactor will usually be your primary source of power for your colony structures. The underground portion of the Tokamak, which is built at the same time as the surface portion, is part of the containment vessel. 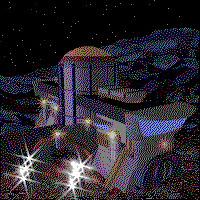 You have the option of bringing down the Tokamak from the starship, or building new ones after you have developed the technology and research with local resources to make it work. The Warehouse provides additional space, beyond what`s available at your factories, for the storage of Medicine (1 mass unit), Fuel Cells (2 m.u. ), Luxury items (3 m.u. ), Road Materials (3 m.u. ), Robots (3 m.u. without a fuel cell, 5 m.u. with a fuel cell), and Trucks (6 m.u.). Each Warehouse can hold 100 mass units of storage. The underground Administration building provides a management connection so that you can form research parks and industrial parks. Light Industry tiles immediately adjacent to an Administration building will improve their rate of production by one point per turn. Laboratories immediately adjacent to an Administration building will improve their rate of research progress by 1 point per turn. The Commercial structure is the general store for the colonists. 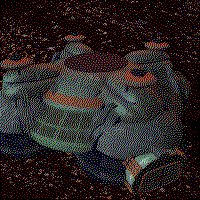 After they have been produced by the underground Light Industry, Luxury items are distributed to the colonists through the Commercial tiles. 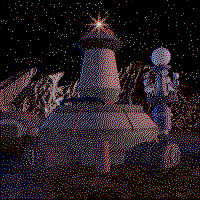 If no Commercial tiles exist in a colony, Luxury items will just pile up in storage unless they are smuggled out the back door by the colonists and distributed to the “employees” of the Red Light Districts. The Geothermal Power Plant is a clean source of energy, assuming you`re on the right type of planet and you`re lucky enough to find a steam vent (fumarole) underground. 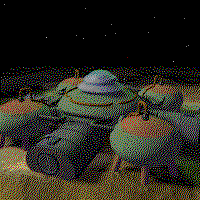 The planets in the original Outpost game are not volcanically active on the surface, so steam vents can only be located by subterranean digging. 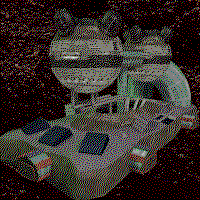 The underground Laboratory is where most scientific research is performed. The surface labs are only for the “dangerous” experiments, such as genetic engineering and nanotechnology. The Laboratory also has a beneficial effect on the Educational Level of the colonists, but not as much as a University. The Laboratory also gives you direct access to the Research Tree so that you can determine the nature of the research being performed. The Light Industry tile is an underground manufacturing facility that does not produce toxic byproducts such as those made by the surface factories. Light Industry can produce Luxury items, Clothing, or Medicine. Recyclables (RCY) from the various manufacturing processes are automatically sent to the SPEW recycling facility on a regular basis. Medicine is produced at the rate of one unit per turn. When a medical emergency strikes the colony, stored medicine is automatically used. If there is no medicine in storage, colonists will die. 100 units of medicine can be stored in a warehouse. Clothing is produced at one unit per turn, and is distributed in Commercial structures. 33 units of clothing can be stored in a warehouse. Luxury items are produced at the rate of one unit per turn per factory, and are distributed in Commercial structures. 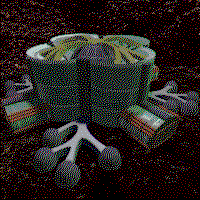 Distribution of luxury items is the primary means of manipulating the morale of your colonists, and Commercial structures draw luxuries at a rate of one per turn as long as there are luxury units available. You must choose which luxury items you wish to produce, from a list that includes fuzzy dice, chia figurines, and wax lips. 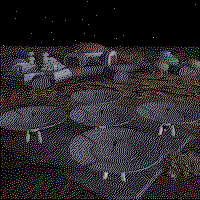 The Medical Facility reduces the damage from colonists affected by disasters, as well as improving the longevity of babies and the adult population. Since there are numerous potential medical effects that result from living on a hostile planet, the Medical Facility generally improves the health of the population by helping people adapt to the environment. Medical Facilities will help control the Plague. Keep in mind that monorails do a very effective job of carrying the plague, so you`d better be ready to cut your losses by bulldozing sections of rail line. If you respond soon enough, you may be able to isolate the plague to just one colony. 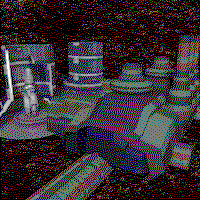 The Mine Shaft is built by the robominer, so this is not a structure you can build directly by placing it on the underground portion of the map. It exists to mark the location of the mine shaft, which you should not interfere with unless you want a nasty surprise. When parents are living on a hostile planet, they can`t just tell their kids to go play outside. The main function of the Park is to provide a safe environment for children, and adults, to play in. This results in improved Morale. The primary function of the Recreational Facility is to provide the colonists with some entertainment to improve their Morale. The Red Light District (RLD) has its advantages and disadvantages. It`s an unusual structure, because you can place it on the map yourself, but it can also be spontaneously generated due to a high Crime level. Although the RLD improves Morale and the Birth Rate, it also draws two units of Luxury items per turn, drawn directly from storage whether or not a Commerical structure exists, for maintaining operation. If the Crime level remains high, more and more of your Residential units will turn into RLDs. The only way to control the spread of RLDs is to lower your Luxury production or lower your Crime level by adding Police stations to your colony near the RLDs. Residential units are necessary to house your population in comfort as soon as possible. 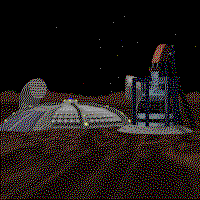 During the arrival phase, your colonists live in the crowded conditions of the Command tile that was built by your Seed Factory, but this is only an interim measure until the Residential units are built underground. Since it`s also dangerous living on the surface, Morale will start dropping soon after you land. It`s best if you have less than 25 people living in each Residential unit, since this will improve their Morale. The legal occupancy limit is 25, so if you cram more than 25 people into a Residential unit, the Crime level will start rising and Morale will start dropping. This is the lower portion of the Tokamak Fusion Reactor built directly above it on the surface. 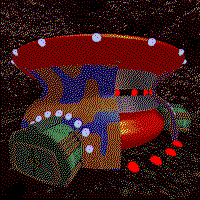 This Containment vessel is generated when you build the surface structure, so it`s not an option for you to build. 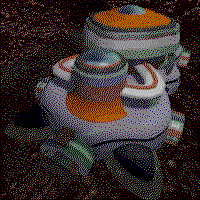 However, you don`t want to build new structures adjacent to a Containment vessel because it makes those colonists nervous. The University maintains and improves the Educational Level of your population, which also has a beneficial effect on Morale. After 100 turns, the crowding and the heavy use of aging university equipment stops increasing the Educational Level at that University, but the improved Morale effect will continue. Since the maximum Educational Level is 100, you may hit the limit sooner than 100 turns, but the level does degrade over time due to new children entering the educational system. With regard to energy requirements, the structures are grouped according to their similarities in power consumption. These six energy classes apply once the structure is built; during construction, in most cases, the extra power requirement will be indicated by adding one level to that structure`s normal energy class.